This Buprenorphine drug test will detect use of Suboxone®, Subutex® or Buprenex® (buprenorphine hydrochloride). This is a Suboxone drug test, which detects the drug Buprenorphine. This Suboxone drug test is a rapid, one step test for the qualitative detection of Buprenorphine in human urine. For healthcare professionals including professionals at point of care sites. For in vitro diagnostic use only. Buprenorphine is a potent analgesic often used in the treatment of opioid addiction. The Buprenorphine drug is sold under the trade names Subutex®, Buprenex®, Temgesic® and Suboxone®, which contain Buprenorphine HCl alone or in combination with Naloxone HCl. Similar to opiates such as Methadone, Subutex® and Suboxone® are designed as a replacement for injected and snorted opiates such as heroin. Buprenorphine, a derivative of thebaine, provides pain relief and also produces a narcotic high. In fact, Buprenorphine was originally used for pain relief purposes over many years ago. Substitution treatment is a form of medical care offered to opiate addicts (primarily heroin addicts) based on a similar or identical substance to the drug normally used. In substitution therapy, Buprenorphine is as effective as Methadone but demonstrates a lower level of physical dependence. Concentrations of free Buprenorphine and Norbuprenorphine in urine may be less than 1 ng/ml after therapeutic administration, but can range up to 20 ng/ml in abuse situations. The plasma half life of Buprenorphine is 2-4 hours. While complete elimination of a single dose of the drug can take as long as 6 days, the window of detection for the parent drug in urine is thought to be approximately 3 days. The One Step Buprenorphine Drug Test Device is a rapid urine-screening test that can be performed without the use of an instrument. The test utilizes a monoclonal antibody to selectively detect elevated levels of Buprenorphine in urine. 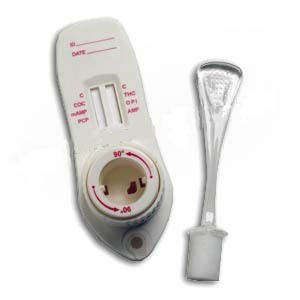 The One Step Buprenorphine Test Device yields a positive result when the Buprenorphine in urine exceeds 10 ng/ml. For more information on the drug Suboxone - Buprenorphine, see Suboxone - Buprenorphine Drug Information. The One Step Buprenorphine Test Device is a lateral flow chromatographic immunoassay for the detection of Buprenorphine in human urine at a level relative to the Buprenorphine cut-off concentration of 10 ng/mL. This assay is intended for use by professionals to assist in the determination of drug compliance. This assay provides only a preliminary analytical test result. A more specific alternate chemical method must be used in order to obtain a confirmed analytical result. Gas chromatography/mass spectrometry (GC/MS) or Liquid chromatography/mass spectrometry (LC/MS) are the preferred confirmatory methods. Clinical consideration and professional judgment should be applied to any drug of abuse test result, particularly when preliminary positive results are used. The One Step Buprenorphine Test Device is an immunoassay based on the principle of competitive binding. Drugs that may be present in the urine specimen compete against the drug conjugate for binding sites on the antibody. During testing, a urine specimen migrates upward by capillary action. Buprenorphine, if present in the urine specimen below 10 ng/mL, will not saturate the binding sites of antibody-coated particles in the test device. The antibody-coated particles will then be captured by immobilized Buprenorphine conjugate and a visible colored line will show up in the test region. The colored line will not form in the test region if the Buprenorphine level exceeds 10 ng/mL because it will saturate all the binding sites of anti-Buprenorphine antibodies. A drug-positive urine specimen will not generate a colored line in the test region because of drug competition, while a drug-negative urine specimen or a specimen containing a drug concentration lower than the cut-off will generate a line in the test region. To serve as a procedural control, a colored line will always appear in the control region, indicating that proper volume of specimen has been added and membrane wicking has occurred. The test device contains mouse monoclonal anti-Buprenorphine antibody-coupled particles and Buprenorphine-protein conjugate. A goat antibody is employed in the control line system. The used test device should be discarded according to federal, state and local regulations. Store as packaged in the sealed pouch at 2-30°C. The test device is stable through the expiration date printed on the sealed pouch. The test device must remain in the sealed pouch until use.DO NOT FREEZE. Do not use beyond the expiration date. The urine specimen must be collected in a clean and dry container. Urine collected at any time of the day may be used. Urine specimens exhibiting visible precipitates should be centrifuged, filtered, or allowed settle to obtain a clear specimen for testing. Urine specimens may be stored at 2-8°C for up to 96 hours prior to assay. For prolonged storage, specimens may be frozen and stored below -20°C. Frozen specimens should be thawed and mixed before testing. Place the test device on a clean and level surface. Hold the dropper vertically and transfer 3 full drops of urine (approx. 100 mL) to the specimen well (S) of the test device, and then start the timer. Avoid trapping air bubbles in the specimen well (S). See the illustration below. Wait for the colored line(s) to appear. The result should be read at 5 minutes. Do not interpret the result after 10 minutes. NEGATIVE:* Two lines appear. One colored line should be in the control region (C), and another apparent colored line should be in the test region (T). This negative result indicates that the Buprenorphine concentration is below the detectable level (10 ng/mL). * NOTE: The shade of color in the test region (T) will vary, but it should be considered negative whenever there is even a faint colored line. No line appears in the test region (T). This positive result indicates that the Buprenorphine concentration exceeds the detectable level (10 ng/mL). INVALID: Control line fails to appear. Insufficient specimen volume or incorrect procedural techniques are the most likely reasons for control line failure. Review the procedure and repeat the test using a new test device. If the problem persists, discontinue using the lot immediately and contact the manufacturer. A procedural control is included in the test. A colored line appearing in the control region (C) is considered an internal positive procedural control. It confirms sufficient specimen volume, adequate membrane wicking and correct procedural technique. The One Step Buprenorphine Test Device provides only a qualitative, preliminary analytical result. A secondary analytical method must be used to obtain a confirmed result. Gas chromatography/mass spectrometry (GC/MS) or Liquid chromatography/mass spectrometry (LC/MS) are the preferred methods. It is possible that technical or procedural errors, as well as other interfering substances in the urine specimen may cause erroneous results. A positive result indicates presence of the drug but does not indicate level or intoxication, administration route or concentration in urine. * Negative samples were confirmed negative using LC/MS by pooling these samples into groups of 15. Fifteen (15) urine samples with specific Gravity ranging from 1.004 to 1.034 were spiked with Buprenorphine to the concentrations of 5 ng/mL, 15 ng/mL and 20 ng/mL. The One Step Buprenorphine Test Device was tested in duplicate using the fifteen neat and spiked urine samples. The results demonstrate that varying ranges of urinary specific gravity do not affect the test results. The pH of an aliquoted negative urine pool was adjusted to a pH range of 5 to 9 in1 pH unit increments and spiked with Buprenorphine to 5 ng/mL, 15 ng/mL and 20 ng/mL. The spiked, pH-adjusted urine was tested with the One Step Buprenorphine Test Device in duplicate. The results demonstrate that varying ranges of pH do not interfere with the performance of the test. A study was conducted to determine the cross-reactivity of the test with compounds in either drug-free urine or Buprenorphine positive urine. The following compounds show no cross-reactivity when tested with the One Step Buprenorphine Test Device at a concentration of 100 ng/mL.